Lately I have been featuring more skincare than make-up on my blog and it has resulted in me receiving many more messages on social media than usual. Ladies seem to prefer reading about skincare over make-up . 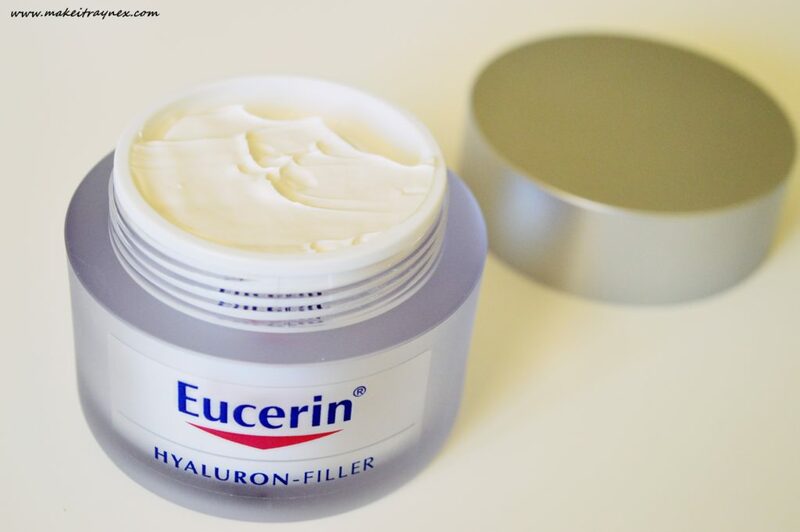 One of the most asked – if not the most asked – question would be which moisturiser I suggest. Now, skincare is so personalised; skincare is pretty much a damn battlefield. Everything depends on your skin type, and even then, you may have an adverse reaction to an ingredient in the product. So by no means am I telling you to run out and buy the products I feature on my blog, but these are the products which suit my skin the best. 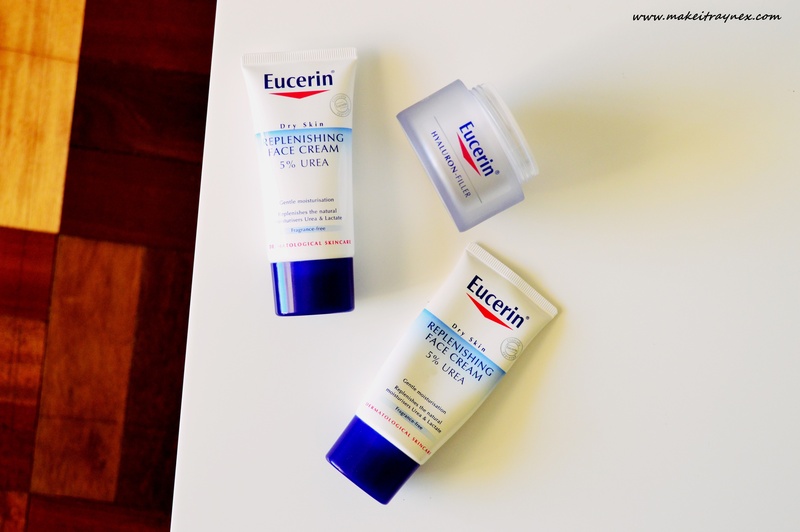 Eucerin has always been one of my favourite brands for creams. Their UreaRepair Plus 5% UREA Lotion is my current favourite body moisturiser! There is always something new and exciting being launched from them and generally their products are huge hits. 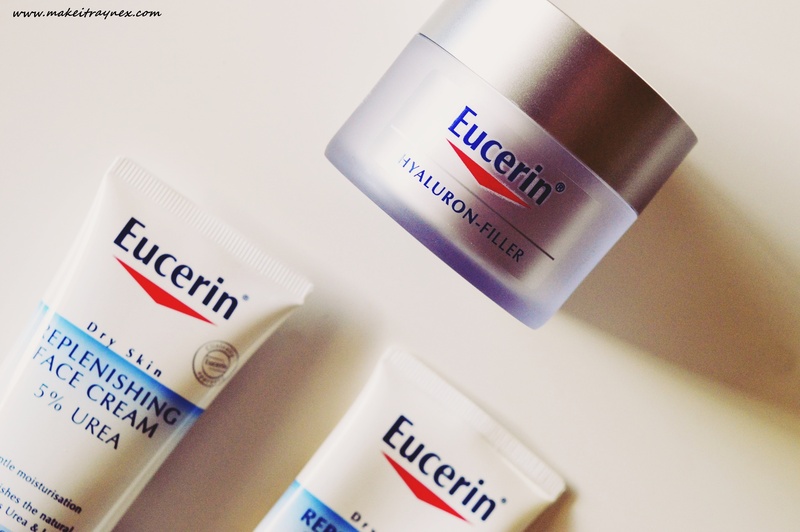 These two face moisturisers, the Hyaluron – Filler and Replenishing Face Cream are my top two picks. Researching this online pulls up MANY amazing blog reviews. It seems like this is one of the top recommended products to peeps who go onto Roaccutane. Using products containing urea is honestly one of the most beneficial things you can do to your skin. Just try it. It is a natural component that, quite literally, binds the moisture into your face. So if dry and/or rough skin is your issue, keep an eye out for products containing urea. And even more so, the Replenishing Face Cream lists urea as the second highest concentration of an ingredient in the formula. It feels light on your skin, lighter than the below mentioned product. And it is fragrance free and just gives you a huge boost of moisture. It is a nice option for when applying make-up on top as nothing separates and goes all all funny like with some face creams. R199 for 50ml. Available for dry skin and also for very, very dry skin. 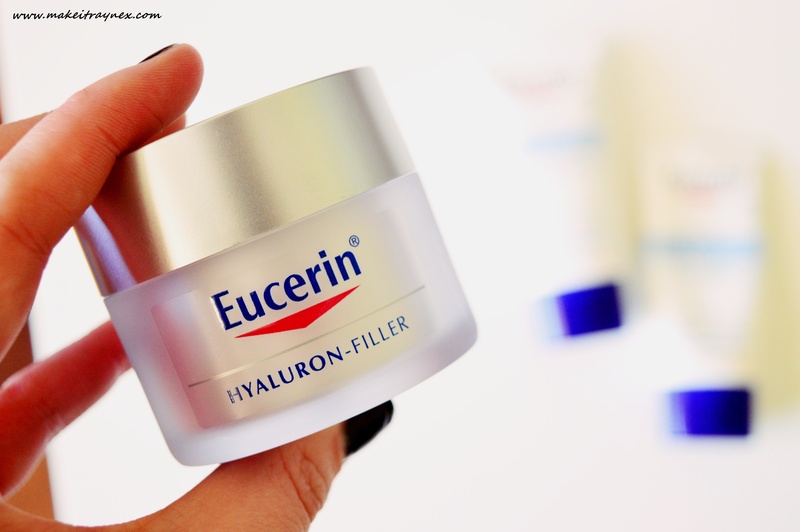 I posted my review on the Elasticity+ range previously and it was my go to night cream until this Hyaluron – Filler came along. It is not advertised as being geared towards any age group in particular. It is advertised as “An advanced formula night cream to target and plump up even the deepest wrinkles from within.” I would then assume it is for the age group of maybe 30+ – but at 23, I don’t think it is too early to start going to battle with fine lines. I can swear that these lines on my forehead are getting worse by the day! The feel of the cream is thick and almost a whipped consistency. I get a bit worried when a cream is too thick. It has me imagining that it will get sucked into my pores and basically clog up my entire face. Not with this one though. Of course once you have wrinkles, you need a bit more than face creams to get rid of them. Thanks to the humectants in the Hyaluron – Filler, your wrinkles are left looking softer and more plumped out. Basically, you cannot erase your wrinkles (with face creams, that is) but you can do what you can to soften them out and disguise them. I find that with regular use, I may not see the hugest decrease in wrinkles when I am not wearing make-up. But once I have applied my makeup, that is when I SERIAAAASLY notice a difference in my forehead lines and crows feet. Speaking of crows feet, I do indeed use this around my eye area if I am feeling particularly lazy. The packaging of these creams is one of my fave too. The tub is made of glass which makes it weighty and feels super luxe. Obviously glass comes with the added negative of possibly dropping it on the floor but I do appreciate the extra luxe feel. The tubs also come with a protective covering over the cream so you will never accidentally purchase one that may have been tested in store. Did you enjoy this post? I have noticed lately my blog views have been amazing when it comes to skincare posts! Don’t forget to leave me a comment on any other skincare products you would like to see reviewed. Hello – yes, skin care is no. 1 priority, especially when in your mid 50’s and everything seems to be going downwards! Please could you review the SOLAL SKINCARE PRODUCTS. They are pricey and I want to know whether worth it, result orientated or just another money making product for suckers like me!